One of the most comprehensive surveys of the public's general opinion of the media was done in 1997 by the Pew Research Center for The People & The Press, formerly known as the Times Mirror Center for the People and the Press. 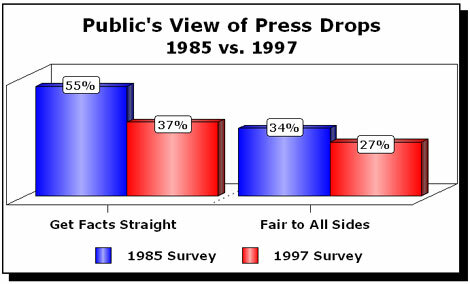 This research compared poll results from the mid-1980s with the late-1990s, (using identical questions) and determined a growing percentage of the public realize the media are biased, inaccurate and an obstacle to solving problems. Two-thirds (67%) said they agreed with the statement: 'In dealing with political and social issues, news organizations tend to favor one side.' That was up 14 points from 53 percent who gave that answer in 1985. Those who believed the media 'deal fairly with all sides' fell from 34 percent to 27 percent. 'In one of the most telling complaints, a majority (54%) of Americans believe the news media gets in the way of society solving its problems,' Pew reported. The percentage who felt 'news organizations get the facts straight' fell from 55 percent to 37 percent.